he roots of Mexico's capital lie in the so-called Historic Center, an area which occupies the original core of the city which the Aztecs set out like a celestial map, aligned according to the four cardinal points. The Spanish then retraced the area in a checker board pattern, and it was subsequently rebuilt as a convent-filled, aristocratic metropolis before eventually transforming into a microcosm of modernity. Consequently, the visitor finds this to be a lively, boisterous and contradictory place, guaranteed to stir the senses: the discreet tones of city center architecture are based on an interplay between pink sandstone and red tezontle rock; its rhythm determined by an age-old penchant for commerce, framed beneath wrought-iron balconies; its intensity pulsating to the beat of religious festivities and social struggles. Although the constant flow of vehicles which crisscross this downtown area today is slowly but surely leading to its extinction, visitors can still tour the streets in fixed-route streetcars or bicycle taxis, although it is best to simply tour this area on foot. Mexico's Cathedral is good starting point of the visit. The geometric regularity of the downtown area allows the visitor to become acquainted with various neighborhoods (roughly grouped into four sectors: San Sebastian, Santa Maria, San Juan and San Pablo) which converge at the Zocalo, or to visit certain streets that denote the four cardinal points and which are named after Latin American republics, national heroes and events, with one or two names stemming from traditional anecdotes. The city may also be enjoyed from one or more of its old squares and gardens. This great square, called the Zocalo, evokes the place of homage and center of the world which was the heart of the ceremonial nucleus of Mexico-Tenochtitlan. The Zocalo brings together the rhythmic beating of drums, the ankle-rattles of the native dancers and the glowing incense of modern day medicine men. A point of reference, of protest, of ritual and of national celebration, by night it offers an imposing spectacle which culminates in the tumultuous popular festivities on the 15th of September (eve of Mexico's Independence Day). Dominating the east end of Alameda Central, Mexico City's leafy city-centre park, is the white-marble Palacio de Bellas Artes (Palace of Fine Arts). Construction of the concert hall began in 1904 under Italian architect Adamo Boari, who tended toward neoclassical and art nouveau styles. But the building's heavy marble shell began to sink into the spongy subsoil, and work was halted. Architect Federico Mariscal eventually finished the interior in the 1930s, with new designs reflecting the more modern art deco style. This is the place to see if you're mad about murals: some of Mexico's finest are found upon the immense wall spaces of the second and third levels. Works by Rufino Tamayo, David Alfaro Siqueiros, José Clemente Orozco and Diego Rivera are among the highlights. Spans several kilometers along the city's grand east-west, French-inspired avenue; an area with strong European influence; outstanding museums (including the Anthropological Museum, children’s Papalote Museum and Chapultepec Castle) and the stylish Zona Rosa and Polanco areas. About 2 km. north of the Alameda is the area known as Tlaltelolco, site of several historic events, some glorious and others tragic. The area served as a satellite city to the Aztec capital, and was the site of the area's major marketplace. It is also here that the last battle to take the capital was fought in 1521. More recently, the area has been the site of a bloody political demonstration just days before the 1968 Olympic Games, and its massive housing projects suffered horrendous damage during the earthquake of 1985. The major historic attraction is the Plaza of Three Cultures, a fascinating site that dramatically portrays the city's history. The plaza juxtaposes three periods of the city's history. Atop the excavated remains of Aztec temples, in what was once the Aztec's most important marketplace, is a church dating back to 1609. Nearby stands the modern Foreign Ministry building. exhibit halls opened. All the exhibit halls surround an enormous central courtyard that is partially covered by a gigantic 5,300 sq.ft. "umbrella" resting atop a sculptured bronze column. Plan on spending several hours. English speaking guides are available. Fine gift shop on site; closed Mondays. The Museum finished a $13 million renovation in Dec. 1999, adding interactive high tech enhancements. Begun in 1785 atop a 200-foot-high hill, it was originally intended to be a weekend retreat for Spanish viceroys. Upon completion in 1841 it became a military academy which earned infamy as the last stronghold against the U.S. invasion in 1847. Maximilian converted the castle into his private residence in 1864, and it later served as home to Mexican presidents until 1940. Today it is the fine Museum of Mexican History with displays, antiques, artifacts and vibrant murals by famed Mexican painters O'Gorman, Orozco, and Siqueiros. Recently re-opened following a two-year $32 million renovation, this is Latin America's best zoo. It features 1,300 animals representing 220 species housed in natural habitat settings. The zoo's main draw is its family of five Chinese panda bears. There is also an aviary and a rare black rhinoceros. Admission is free; closed Mondays. Other museums in the park include the Museum of Modern Art and the sleek Tamayo Museum, both favorites of art lovers. The "high fashion" center of Mexico City, this stylish neighborhood to the north of Chapultepec Park is home to many of the capital's chic boutiques, trendy restaurants and hip night spots. Dozens of European designer shops line Avenida Presidente Masaryk. Many of the city's most popular new restaurants are here, including Spagos, Los Alcatraces, Chez Wok, and Casa de Campo (see Dining section for details). 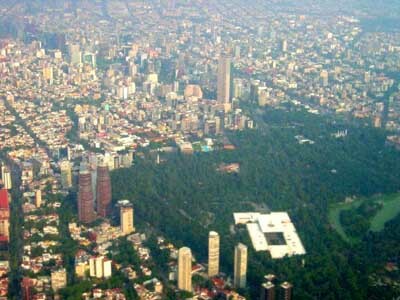 About 10km (6mi) south of downtown, Coyoacán was Cortés' base after the fall of Tenochtitlán. It remained a small town outside Mexico City until urban sprawl reached it 50 years ago. Close to the university and once home to Frida Kahlo and Leon Trotsky (whose houses are now the fascinating Museo Frida Kahlo and the Museo Léon Trotsky), it still has its own identity, with narrow colonial-era streets, plazas, cafés and a lively atmosphere. Especially on the weekends, assorted musicians, mimes and craft markets draw large relaxed crowds from all walks of life to Coyoacán's central plazas. A pleasant way of approaching Coyoacán is via the Viveros de Coyoacán (Coyoacán Nurseries), a swath of greenery, popular with joggers. To the southeast of the city lies the traditional neighborhood of San Angel. Its wistful name spirits us back, not surprisingly, to the times of the founding of the Carmelite college during the 17th Century, established here to take advantage of a location ideally suited to quiet meditation and the contemplation of Nature. The temperate climate, abundance of water, and the rich, firm subsoil also encouraged the growth of a once-famous orchard, the establishment of textile and finishing mills, and the construction of many fine country estates inhabited by the wealthier citizens of Mexico City. To this day the local streets retain their cobblestones and invariably lead into small, romantic plazas. Many of the local houses, with their capricious architectural details, today serve as centers for different cultural and artistic activities. Diego Rivera's Studio The urban sprawl of the city divided San Angel, cleaving it from Chimalistac, another charming neighborhood. On Saturdays the San Jacinto plaza comes to life with the hustle and bustle of the local handicrafts bazaar, which adds to the already burgeoning variety of antiques and fine handicrafts which can be found here each day. Xochimilco, which means 'Place where Flowers Grow' in Náhuatl, lies about 20km (12mi) south of downtown Mexico City. It is known for its canals, which remain one of Mexico's favourite destinations for fun and relaxation. Hundreds of colourful trajineras (gondolas), each punted by a man with a pole, cruise the canals with parties of merrymakers and tourists. You can board one at one of the embarcaderos (boat landings) near the centre of Xochimilco. On weekends, a fiesta atmosphere takes over and the waterways become jam-packed with boats, people and tourist-targeting touts. Weekdays offer a more relaxing vibe.